The ASP.NET Web Forms Scheduler allows you to manage lists of various activities (appointments/events) on different available views for any number of resources. The ASP.NET Web Forms Scheduler is an event calendar that facilitates almost all basic Outlook and Google Calendar features. It allows the user to plan and manage appointments efficiently. 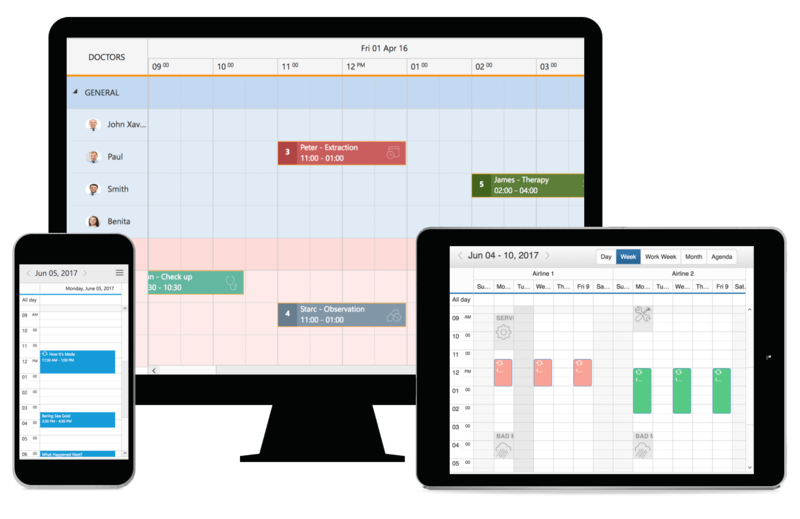 It features multiple scheduler view modes, quick mapping of data source fields, easy rescheduling of appointments through drag and drop, and a resize action, as well as clear representation of appointments with more customizable options. The built-in view modes available in ASP.NET Web Forms Scheduler are: day, week, work week, month, agenda, and timeline views. These view modes allow you to display appointments across different days and months. The Scheduler can also display the user-specific date collection on custom view, which can be of a periodic date range or different date collections. The Scheduler control is available with two types of orientation: vertical and horizontal. By default, the timescale of ASP.NET Web Forms Scheduler renders in vertical orientation. The same time cells are made to render horizontally in the horizontal orientation. All four built-in view modes such as day, week, work week and month view are available in both vertical and horizontal orientation. Appointment data binds seamlessly with ASP.NET Web Forms Scheduler through various local and remote data sources such as: JSON, RESTful services, OData services, and WCF services. There is built-in support for better event handling, such as easier appointment creation and editing using the default event editor or through intuitive drag-and-resize actions. Easily configurable recurring events to repeat on a daily, weekly, monthly, or yearly basis. You can also change the look and feel of events by customizing their default appearance and style using templates. Reschedule appointments easily by dragging them onto the desired time slots. You can also drag unscheduled appointments from an external source onto the ASP.NET Web Forms Scheduler. Easily extend a Scheduler appointment’s time by resizing either its start or end handlers. You can also see the real-time updates over the resized appointments. Built-in support is available for assigning resources to events as well as scheduling resources. Group appointments based on resources by using the clear view of each resource’s availability. You can also set different working days for each resource. Display the resources as rows in a hierarchical tree structure based on grouping levels. Arrange the appointments of a resource horizontally in its appropriate row against the horizontal time axis. The ASP.NET Web Forms Scheduler (event calendar) has a highly responsive layout and a finely optimized design for desktops, touch screens, and smart phones. This helps the application to scale elegantly across all form factors without any additional effort. Time slots in the ASP.NET Web Forms Scheduler can be blocked, so that restrictions can be imposed on those time slots, and the appointments that lie on those blocked time range. Blocked appointments will be made read-only and CRUD operations on them will be prevented. The ASP.NET Web Forms Scheduler supports two types of printing: either print the complete scheduler along with its background color or print specific appointments. It also supports importing the ICS files generated from calendars like Outlook, Google, and others. The Scheduler appointments can be exported to any of the following file formats: ics, pdf, and xls. The height and width of Scheduler cells can be easily customized. Another option exists to set auto-height for scheduler cells, thus allowing the cells of the timeline view to adjust automatically based on the appointment count. Bidirectional data communication conveys the server-side appointment updates made on ASP.NET Web Forms Scheduler to all the connected clients through SignalR.